It’s the Bout of the Blessed. The Fight of the Faithful. The Rivalry of the Righteous. The Duel of the Devoted. 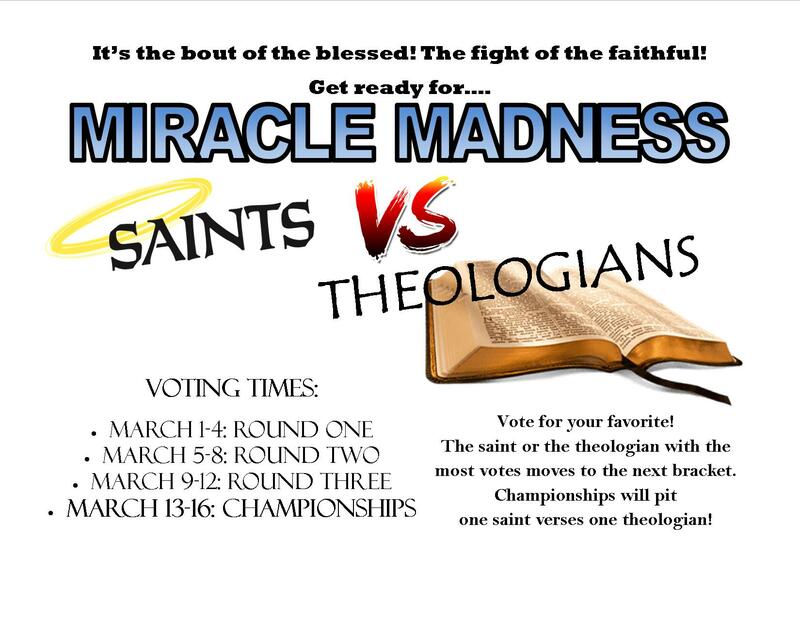 This year’s Miracle Madness pits saints verses theologians! Four rounds will have selections of saints and theologians. The one with the most votes at the end of the voting period will move on to the next bracket! There will be one large bracket in the library lobby to check out the progress! Round One Winners – Saints: St. Francis, St. John, St. Mother Teresa, St. Hildegard. Round One Winners – Theologians: Bonhoeffer, Luther, Wycliffe, Kassani. Round Two Winners – Saints: St. John the Apostle and St. Hildegard von Bingen. Round Two Winners – Theologians: Dietrich Bonhoeffer and Kassani. Round Three / Semi-Finals Winners: St. John the Apostle and Dietrich Bonhoeffer. Who will reign supreme? Vote for your favorite today!